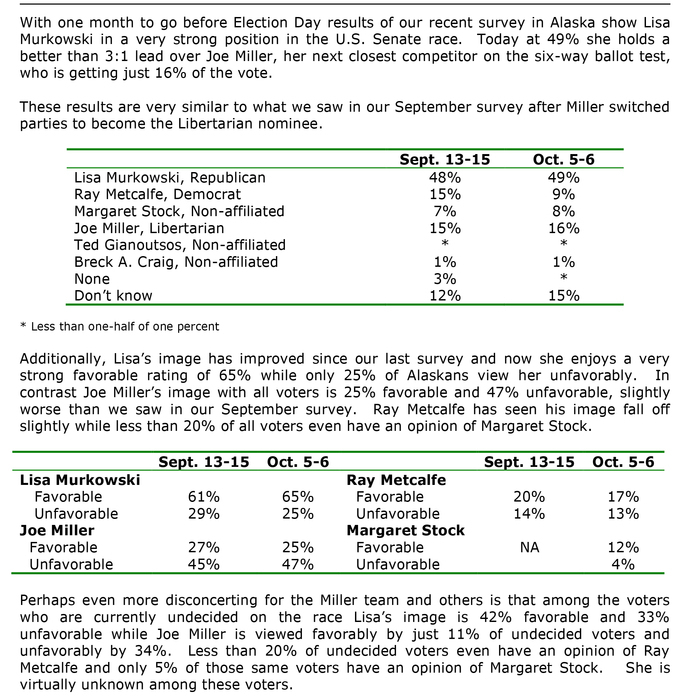 This afternoon Sen. Lisa Murkowski’s campaign released some surprising polling data. 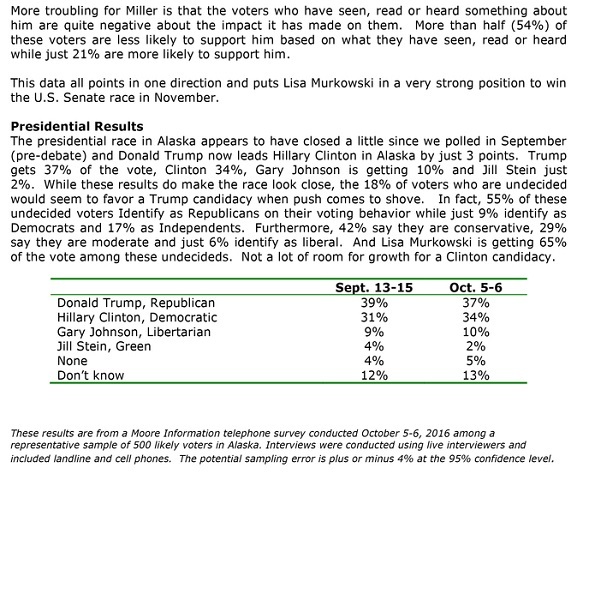 The polling, conducted by Oregon-based Moore Information between October 5-6, shows Murkowski up by a large margin against all of her challengers. Murkowski’s race isn’t the interesting part of the data. That distinction goes to the presidential race in Alaska. 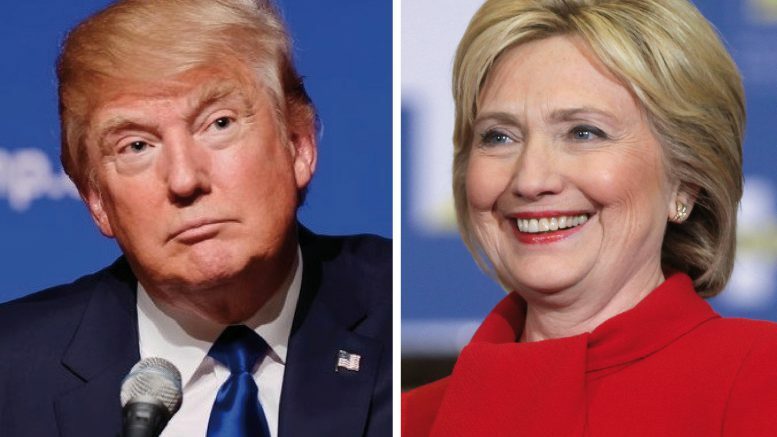 Those numbers show that Democrat Hillary Clinton has closed to within 3% points of Republican Donald Trump in the Last Frontier. That is inside the poll’s 4% margin of error. That Murkowski decided to release the presidential race numbers, which she was under no obligation to do, has to raise questions about how interested in seeing her party’s top-of-the-ticket candidate win the senator really is. 4 Comments on "Murkowski Polling Data Shows Clinton Down Only 3 Points In Alaska"
I wonder if this was the poll that I got called on recently. The caller ID said Murkowski and at the end of the poll, it said it was paid for by Murkowski. I answered truthfully, but I have to admit that seeing it coming from a Murkowski phone number made me uncomfortable and I wondered if they were tracking answers to individuals. I know Murkowski personally and while I like her, I have decided not to vote for her this time. First was her vote on Loretta Lynch, then flip-flopping on Supreme Court confirmation, but the final straw was her “support” of Trump. I wrote her name in last time. She won’t be getting my vote this time. Murkowski & Sullivan both asked Trump to step aside. She never endorsed him to begin with and says she can’t support him. Her “lack of support” was pretty wishy washy at first. Yes, she has asked him to step aside, but we all know that’s not going to happen. Sorry, too little, too late for me. So when is Lisa Murkowski going to tell us whether or not she supports Trump? Was she waiting for this poll, and now she will try to play both sides by remaining silent about the top of the ticket?